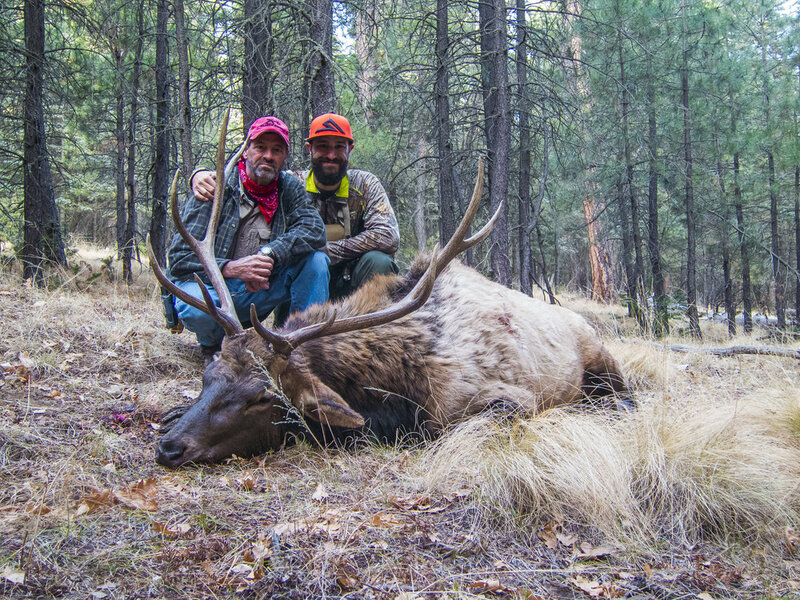 Unknowingly, this elk hunt started in April, 2016 when magically, my dad, uncles, cousins, and I drew late season 5A bull tags. I was living in North Carolina and hadn't seen my family in over a year. The plan was for all of us to stay at my uncle's cabin for a few days and hunt hard. The setback was figuring out how I would be able to make the trip happen. Unfortunately, I was unable to go; they went up, had a fun time, but ultimately came home empty handed. Jump to April, 2017. My family and I were in the throes of packing up our house and getting ready to move back home to Arizona when my dad texted me, "Credit cards got hit!" Immediately, all that devastation (probably too strong of a word but I'll go with it) from missing last season disappeared and it was time to get the taste of tag soup out of my mouth. I ramped up my workouts, and began researching the elk heard in Unit 5A. I read the blurbs from Game and Fish, reached out to hunters on social media, and began studying the satellite imagery of the unit. 5A is not an easy unit to hunt, the southern portion is densely wooded and riddled with deep canyons that fall off the Mogollon Rim. The northern part of the unit is sparse, with a beautiful "transition" area where the pines break away and start to mix with junipers and wide open grasslands. There are a lot of elk in the unit, but they are simply hard to find, especially during the late season as they've been pressured since early September. During the previous season, my dad hunted that transition area and saw only one cow elk and a decent amount of sign. Knowing our hunt fell after the rut and the bulls would be seeking sanctuary and trying to escape pressure, I focused my efforts on the wooded canyons near the Rim. I got a great tip from a friend at work, and a buddy and I made four separate scouting trips to the area. We found a beautiful meadow with tons of water, feed, and cover around it. The meadow runs south to north and lies beneath two roads. Amazingly, we rarely saw anyone in the area. Subsequently, we saw elk on every trip. On my last day of scouting, I woke up early and walked the edge of the meadow, I spotted a spike bull and a cow feeding. I watched them graze and eventually escape up into the timber. Using my OnX maps, I noticed an abandoned Forest Service road coming out of the meadow. Now, this road sits at the bottom of a draw that flows into the meadow. There are steep ridges on either side and a nice washout that runs along it. There is so much deadfall on the road that my dad dubbed it the Obstacle Course. Sometimes, as a hunter, you come across an area and you just know it's a good spot. Yeah, there are visual cues: sign, tracks, rubs...etc But there's also just a feeling. I got goosebumps walking this road, it was so elky! I walked maybe a quarter of a mile and decided I didn't want to blow out the area and headed back to camp. I kept thinking about that road for the whole next week. Finally, after a year and a half of anticipation, it was opening day. I convinced my dad to make the hour drive to the meadow. I almost lost my mind on our way in that morning because the Forest Service decided to do a prescribed burn a mile north of my meadow. The burn turned out to be a blessing in disguise as I think it kept people out of the area. That first day, we walked the entire meadow. We noticed the rear end of an elk. It's head was down, and it was feeding up the ridge headed into the timber. It never lifted it's head and disappeared behind some trees. My dad and I were cautious and stayed back to try to spot it again. We played it safe, but the whole time, I wanted to try to head it off. We never saw that elk again. We saw a decent amount of elk that morning, but no bulls. We walked a big circle along the outer edge of the meadow and eventually made our way up that road from the week before. We jumped a few more elk, and got within 60 yards from a feeding cow. The rest of the day was a bust. We hiked roughly 9 miles. We got back to the cabin late, my dad wasn't too happy with the drive, the dirt roads, and the lack of cell service. I knew he didn't want to drive down there again, I also knew he was conflicted because we saw so many elk. He begrudgingly went along with my plan for day two; walk the eastern edge of the meadow at first light and then head up the Obstacle Course. We were quietly still hunting up this road, peering upslope through the timber looking for elk filtering through the trees. When all of a sudden we hear a chorus of coyotes calling loud, somewhat close. I was literally in the middle of stepping over a downed log when my dad spotted the tail end of an elk upslope on our right with it's head down feeding. It stepped behind a tree, and another one took it's place. A cow. I'm looking through my rifle scope, still straddling the log. The elk were slowing feeding in the same direction that we were traveling. The terrain between her and I was thick, and covered with crunchy pine needles, leaves, and sticks. There's no way we're walking straight uphill and it was too thick to make a good shot. Another elk steps into the gap and I notice that it's a spike. I'm not making the same mistake as the morning before. I know the road ahead bends towards their line of travel and that the timber opens up. I say "Spike, there's a spike." and I take off. I'm moving fast but quietly trying to get to the open bend in the road. My dad never heard me and is wondering "What the hell is he doing!?" as he's still trying to spot a bull in the group. I get to where the timber starts to open up and see the elk cut down ridge towards me. I take two big steps and drop to one knee at the big bend in the road. Three cow elk cross 20 yards in front of me, and I notice a bull behind them. He stepped into the gap and I was able to make a good shot. He whipped around, ran twenty yards and dropped. Instant rush of adrenaline. I'm shaking. He pops back up and I try to settle my scope on him but it's bouncing like an Impala in a 90's Hip Hop video. I was able to settle my breath and squeeze another shot off, right through the lungs, and he dropped for good. I'm shaking even more, my dad is ecstatic. I pick up my shells. When I walked up to him everything hit me at once. All the anticipation, the frustration of missing last season, the scouting, endless questioning, and doubts, tension about where to hunt, and five unfilled bull elk tags. The lump in my throat was large and I lost it when I grabbed his antlers and looked him over. I feel every animal I kill, but this one was different. I remarked that I felt the same as I did the day I graduated with my Master's degree. I think that's because in grad school, I focused on making work about hunting. For the last four years of my life I have been studying hunting, history, and conservation. I've been looking at images, reading books, listening to podcasts, and watching shows, and videos. In a way this elk is a graduation of sorts, I earned a Master's in hunting as much as photography, and this hunt was the culmination for me. And I got to share it with my dad, still at 60 years old, he's the best hunting partner. I got to share it with my best friend, Richard, who went on every scouting trip with me, who listened to me drone on and on about spots, and rubs, and roads and everything in between. This elk is as much theirs as it is mine. And it all happened on public land. The Coconino National Forest. Absolutely none of this would have happened without public land. People ask me why I care so much about this stuff and this is why. These memories, the food on my table, the time bonding with my wife while we butchered my elk, and my son being infatuated with my "elko"; simply not possible without public land, PERIOD, END OF STORY. There's no question.